The Enchanted Dagger​ is an epic fantasy novel, that while written for adults, is Young Adult friendly. The protagonist, Beck Conleth, begins the book living a quiet life in a seaside town with his grandmother. She sends him to retrieve his father's bones and a family dagger, and the adventure ensues. In addressing this genre, I've tried to bring my own style and creativity to not only the setting, characters, and conflicts, but to the overall battle between good and evil--which is at the core of every epic fantasy. ​The novel was a Compton Crook Award Finalist and Maryland Writers Association Book Award Winner. It has been called "a strong tale set in a world intricately woven through with magic" by award-winning author, Jody Lynn Nye; "An absorbing tale...finely crafted" by novelist, Roxanne Bland; and "capably-written, energetic, and entertaining" by prolific short story writer, Jim Lee. A sample of the positive reviews: "Adventure, magical creatures, enchantment, and evil lurking around every corner...a very enjoyable read" from Getting Your Read On​ (Aimee Brown, reviewer) and "A thrilling story...recommended to all readers of fantasy adventure. Five stars and a thumbs-up to an excellent book" from Books 4 Tomorrow (Ellen Fritz, reviewer). The world-building to create Lifthrasir, the setting of The Enchanted Dagger, ​was both fun and daunting. Lifthrasir is the name of the woman who survives Ragnarok, and means one who clings to and celebrates life - so it is an apt name for a work where characters must make the right choices or face dire consequences. I've tried to not only incorporate pieces of known mythology, but invent my own to give the book and its universe a rich tapestry of legends, myths, and lore. 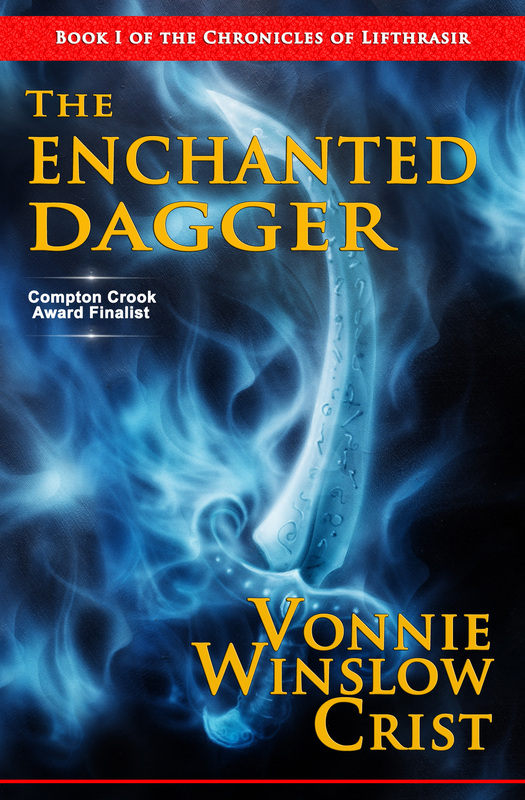 Cover of "The Enchanted Dagger" by Vonnie Winslow Crist. The Greener Forest​ is a collection of short stories and poems. The title refers to that magical place where Faerie and the everyday world collide. There is dark and light, evil and good, and uncertain dusky gray lurking in the stories and poems that inhabit the book's pages. Readers will discover all is not what it seems at first glance, and wondrous things still happen in The Greener Forest. ​While written for adults, the collection is Young Adult friendly. ​The Greener Forest won the eFestival of Books Short Story Collection Award. ​ I've always been fascinated by the creatures of Faerie, from lovely winged sprites to goblins, Brown Men, gremlers, spriggans, giants, and other lesser-known residents. These stories and the linking poems were written over a period of years, but when it came time to put together a collection of my short fiction, I noticed a reoccurring theme of trees and magic in my writing. Plus, I found my magical beings longed to interact with the workaday world we humans live in--including the Baltimore Zoo! The Greener Forest​ has been called "A wonderful, imaginative, multifaceted collection" by author EJ Stevens; "Magikal, enchanting, and so enticing" by young adult novelist, TJ Perkins; and speculative author Robert E. Waters wrote: "Read this collection. You won't be disappointed." Award-winning author, Laura Shovan, says of The Greener Forest: "For Grimm lovers, a darkly imaginative book of modern fairy tales." And many positive reviews can be found on Amazon and elsewhere. ​ The challenge for me as a writer was to bring a newness to old tales and create new fairy stories set in our modern world. Since I believe the world around us still is filled with mystery, magic, and miracles--it was up to me to share that wonder with readers. Owl Light​ is a collection of short stories and poems where early stars flicker, owls wake from slumber, and shadows appear where shadows ought not be. In the prose and poems, Owl Light​ ​dims to darkness, dreams change to nightmares, and dawn in more distant than you know. Again, while written for adults, these stories are Young Adult friendly. Owl Light​ represents my second try at pulling together a collection of short fiction. As in my first collection, I need to discover a thematic thread which ran through the stories. This time, it became clear that owls, owl light (from dusk to dawn), and a sense of wonder were what the stories had in common. Though there are some fantasy stories in ​Owl Light,​ this time, I had science fiction tales to include also--stories set on other worlds or at other times. ​ No matter how fantastical the setting or characters, I wanted to make sure my readers could connect with each tale, and recognize themselves and their lives in the drama. ​ Positively reviewed on Amazon, Guardian Liberty Voice ​says of ​Owl Light: "a spellbinding collection," and January Gray Reviews says: "This book will keep you thinking long after you have read it." Other comments about Owl Light ​include: "a wonderful collection of short stories and poems that transport the reader from the past and into the future...Highly recommended" - speculative author, David Lee Summers; "Fairy tales new and re-imagined, modern myth and ancient ritual. Her stories span galaxies and eons. There is something to resonate with all readers within its pages" - author, Rie Sheridan Rose; "A quiet darkness pervades Crist's stories and poems...If you let the tales lull you to sleep, expect shining eyes to peer into the forest of your dreams"- author Anne E. Johnson; and "...a rich tapestry of magic and ritual. What delights the reader...is the way Crist can apply fresh eyes to a familiar situation and conversely, can present the unfamiliar as if it were an old friend" - award-winning writer, Jonathan Shipley. ​ Murder on Marawa Prime ​is a science fiction murder mystery. Murder, romance, and flawed science experiments make for a life and death race across Marawa Prime. Two people end up dead by the end of the journey. But just who are the assassins and who are the victims? I had fun writing a murder mystery set on a distant planet. The location may be different than earth, but people are people with motives aplenty to commit murder. The challenge with this book was for the reader to identify with the locale and characters even though they are on a different world. The animal side-kick was especially fun - no cat or dog - instead I chose a singing opossum! Again, though written for adults, ​Murder on Marawa Prime ​is Young Adult friendly. ​ Reviewed in Analog - Science Fiction And Fact magazine, Don Sakers had this to say: "​Murder on Marawa Prime is a SF story and a noir mystery, set on a fascinating and well-drawn planet, all packed into a novelette that will leave you wanting more...The story's tightly plotted, and author Crist does an excellent job of keeping multiple balls in the air while revealing the unique and deadly secrets that have brought murder to Marawa Prime." 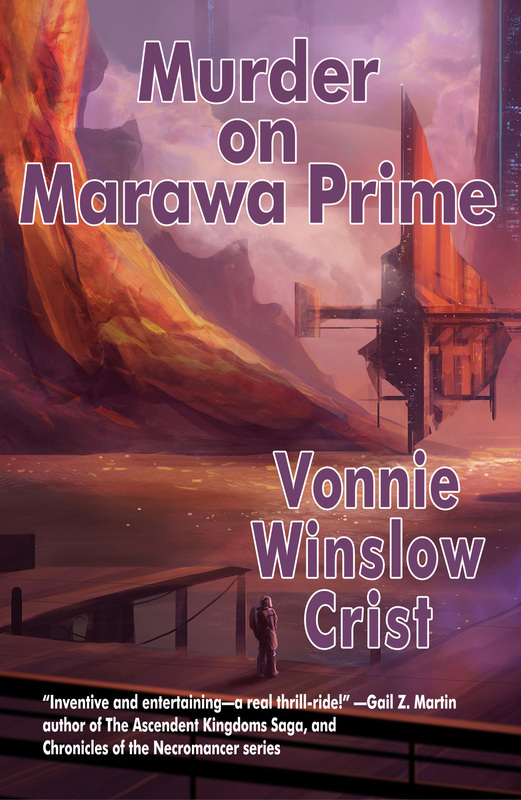 Award-winning Science Fiction author, Charles E. Gannon wrote: "Vonnie Crist serves up some deliciously dangerous interstellar noir in Murder on Marawa Prime. ​One part Raymond Chandler, one part Agatha Christie, and a huge dose of her own exceptionally clean prose and understated worldbuilding, this is a fast-moving nail-biter on a planet at once iconic and alien." Science Fiction author Gail Z. Martin says about the book: "Inventive and entertaining--a real thrill-ride!" And award-winning writer, Deborah Walker writes, "A fast-paced story of assassins, genetic engineering, singing opossums and betrayal, Vonnie Winslow Crist writes the future fantastic." ​ The response to this book has been so positive, I think I will be writing a series of linked stories set on Marawa Prime over the next year. I'm just not certain they will all involve murder and intrigue.